An aerial tramway, sky tram, cable car, ropeway or aerial tram is a type of aerial lift which uses one or two stationary ropes for support while a third moving rope provides propulsion. [not in citation given] With this form of lift, the grip of an aerial tramway cabin is fixed onto the propulsion rope and cannot be decoupled from it during operations. 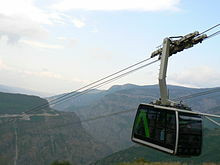 An aerial tramway consists of one or two fixed cables (called track cables), one loop of cable (called a haulage rope), and a number of passenger cabins. The fixed cables provide support for the cabins while the haulage rope, by means of a grip, is solidly connected to the truck (the wheel set that rolls on the track cables). An electric motor drives the haulage rope which provides propulsion. 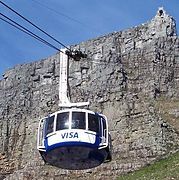 Aerial tramways are constructed as reversible systems; vehicles shuttling back and forth between two end terminals and propelled by a cable loop which stops and reverses direction when the cabins arrive at the end stations. 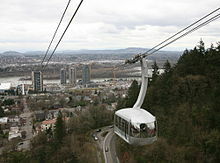 Aerial tramways differ from gondola lifts in that gondola lifts are considered continuous systems (cabins attached onto a circulating haul rope that moves continuously). The first design of an aerial lift was by Croatian polymath Fausto Veranzio and the first operational aerial tram was built in 1644 by Adam Wiebe in Gdańsk. It was moved by horses and used to move soil over the river to build defences. 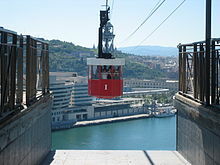 It is called the first known cable lift in European history and precedes the invention of steel cables. It is not known how long this lift was used. In any case, it would be another 230 years before Germany would get the second cable lift, this newer version equipped with iron wire cable. 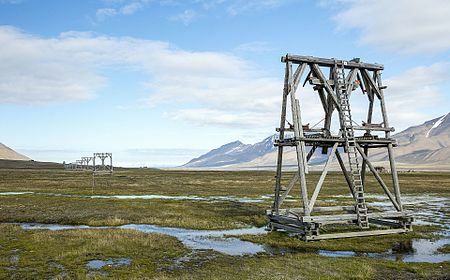 Over one thousand mining tramways were built around the world—Spitsbergen, Russia, Alaska, Argentina, New Zealand and Gabon. This experience was replicated with the use of tramways in the First World War particularly on the Isonzo Front in Italy. The German firm of Bleichert built hundreds of freight and military tramways, and even built the first tourist tramway at Bolzano/Bozen, in then Tyrolian Austria in 1913. Other firms entered the mining tramway business- Otto, Leschen, Breco Ropeways Ltd., Ceretti and Tanfani, and Riblet for instance. A major British contributor was Bullivant who became a constituent of British Ropes in 1924. The perfection of the aerial tramway through mining lead to its application in other fields including logging, sugar fields, beet farming, tea plantations, coffee beans and guano mining. A resource on the history of aerial tramways in the mining industry is "Riding the High Wire, Aerial Mine Tramways in the West"
In the beginning of the 20th century the rise of the middle class and the leisure industry allowed for investment in sight seeing machines. Prior to 1893 a combined goods and passenger carrying cableway was installed at Gibraltar. Initially its passengers were military personnel. An 1893 industry publication said of a two-mile system in Hong Kong that it "is the only wire tramway which has been erected exclusively for the carriage of individuals" (albeit workmen) Going to the Isle of Dogs by Lesser Columbus, Bullivant & Co. 1893 page 10. This item can be accessed through an original held by the North of England Institute of Mining and Mechanical Engineers. After the pioneer cable car of 1907 at mount Ulia (San Sebastián, Spain) by Torres Quevedo others to the top of high peaks in the Alps of Austria, Germany and Switzerland resulted. They were much cheaper to build than the earlier rack railway. One of the first trams was at Chamonix, while others in Switzerland and Garmisch soon followed. From this, it was a natural transposition to build ski lifts and chairlifts. The first cable car in North America was at Cannon Mountain in Franconia, New Hampshire in 1938. After the Second World War installations proliferated in Europe, America, Japan, Canada and South Africa. Many hundreds of installations have emerged in mountainous and seascape areas. The telpherage concept was first publicised in 1883 and several experimental lines were constructed. It was not designed to compete with railways, but with horses and carts. The first commercial telpherage line was in Glynde, which is in Sussex, England. It was built to connect a newly opened clay pit to the local railway station and opened in 1885. There are aerial tramways with double deck cabins. The Vanoise Express cable car carries 200 people in each cabin at a height of 380 m (1,247 ft) over the Ponturin gorge in France. The Shinhotaka Ropeway carries 121 people in each cabin at Mount Hotaka in Japan. The CabriO cable car to the summit of the Stanserhorn in Switzerland carries 60 persons, with the upper floor accommodating 30 people in the open air. 75 km (47 mi) 1937–1941 Asmara – Massawa, Eritrea (71.8 km or 44.6 mi and 3 km or 1.9 mi branch), technically a Funifor. 96 km (60 mi) 1943–1987 Kristineberg-Boliden, Sweden. 13.2 km (8.2 mi) still working as Norsjö aerial ropeway. 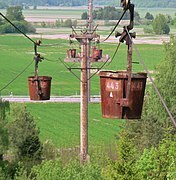 2.4 km (1.5 mi) 1941–2006 Forsby-Köping limestone cableway, Sweden. crossing of Hjälmaren strait. 42 km system. 3.0 km (1.9 mi) 2007 Nha Trang City – Vinpearl Land, Hon Tre Island, Vietnam. Total length 3.3 km. 5.7 km (3.5 mi) Wings of Tatev, Armenia, the world's longest reversible cable car line of one section. April 2, 2004: In Yerevan, Armenia on an urban cable car one of the two cabins derailed from the steel track cable and fell 15 m (49 ft) to the ground killing five, including two Iranian citizens, and injuring 11 others. The second cabin slammed onto the lower station injuring three people.